Sporting a rare triple-citizenship, Aidan is a traveler and seeker of adventure. In the latter half of his childhood, Aidan called the mountains of Colorado home and grew exploring our backyard rugged peaks. He took his passions of building deeper connections to the natural world and ecology to the University of Colorado at Boulder. Studying Ecology and Evolutionary Biology, Aidan took advantage of his collegiate resources focusing his studies on ornithology and sexual selection within populations of barn swallows. 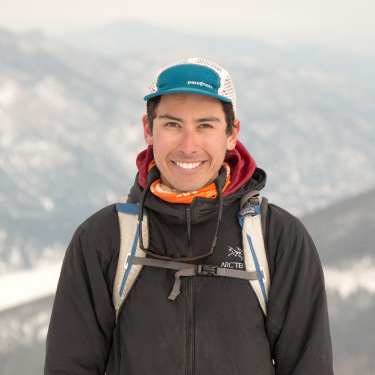 Following the completion of his degree, Aidan began a career in environmental education working for renowned EE programs at the CSU Mountain Campus and Cal-Wood Education Center. As a part of these programs, he learned the necessity of environmental education as a tool for creating compassionate, and knowledgeable leaders with a capacity for critical thinking. Taking on an action research project focused on the power of citizen science, Aidan wants to empower his students to think objectively and become scientists in their own backyards. When not teaching, Aidan feels most at home in cold winter environments with something sharp strapped to his feet. Whether it is a pair of skis or crampons, Aidan is in a continual search for aesthetic climbs and descents in our Rocky Mountains. Catch Aidan every morning wandering the Walking Mountains Science Center with a pair of binoculars around his neck and a comically large camera at his hip.